The Applied Portfolio Management Program’s Gold Team won the seventh annual RISE (Redefining Investment Strategy Education) conference, the largest North American student investment conference. The APMP won the “value” category with the highest risk-adjusted return for 2006 in the undergraduate division at the national investment competition. 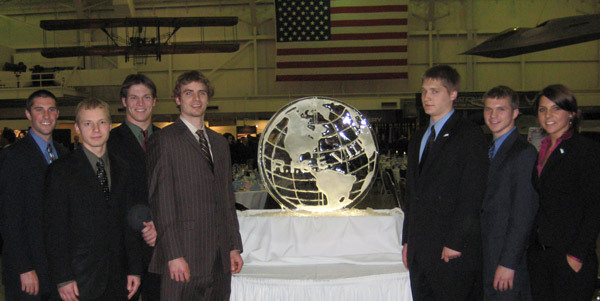 Held in Dayton, Ohio, the competition and conference was March 29-31, 2007. This is the second year that the APMP has won top honors at RISE and continues the APMP’s record of superior placement at the conference. At this year’s conference, the APMP reported a 2006 annual return of 20.96% with only a 2.31% standard deviation in monthly returns. Representing the School of Business and Economics at RISE were Kelly Guzzardo-Plewa, Adam Michaud, Josh Vehring, Devin Magnuson, Mark Malekoff, Lorn Randell, Molly Bush, Lee Warlin, Tyler Skworchinski, Shawn Granlund, Ted Simonson, Cody Meier. Associate Professor Dean Johnson is the Founding Director of the APMP. RISE is a student investment strategy symposium hosted by the University of Dayton. Modeled after the World Economic Forum, RISE connects investment students and faculty with Wall Street professionals in interactive discussions. More than 1,700 participants from 218 colleges and universities, representing every state and continent, attended this year’s RISE symposium. RISE included presentations by some of the biggest names on Wall Street and business, including Ralph Alvarez, President and COO of McDonald’s Corp; Paul Atkins, Commissioner of the U.S. Securities and Exchange Commission; Peter Coors, Chairman Molson Coors Brewing Company; Dr. Hatzius, Chief U.S. Economist Goldman Sachs; Knight Kiplinger, Editor in Chief of Kiplinger’s Personal Finance; and Dr. Ortiz the Governor of the Bank of Mexico. The conference also included portfolio management workshops; career strategy sessions; and networking opportunities. The New York Stock Exchange, The Wall Street Journal, CNBC, TIAA-CREF, the United Nations and Deutsche Asset Management sponsored the event.